I often wondered why children had special classes in art, music, and physical education – but never drama. Drama is valued as much in our society as the others. 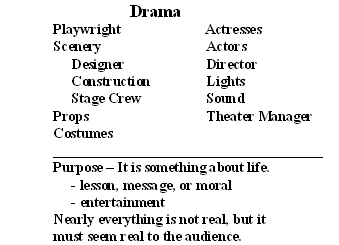 So, the best way to understand drama for young children is create and perform their own plays. So, every spring my combined first and second grade visited behind the scenes of a professional theatre and then returned to the classroom to simulate all that we saw. Our first job was to become playwrights. The plays were not meant to be polished performances – only allowing the best opportunities to learn and fully understand all aspects of drama. Below the age of about eight or nine years old, children are too young to try out for parts. If so, each one is convinced that she will get the desired part, and if that doesn’t happen there is much puzzlement besides disappointment. Young egocentric children just cannot understand beyond their own viewpoint. Which in this case is, “I want that part so why isn’t it mine?? ?” Then there is an aura around the one that got the part. When older, children need to accept that they can’t win everything desired, but then, although disappointed, at least they understand it – understand other viewpoints. But for young children it is not possible to accept something that is beyond their comprehension. Therefore, each child decided upon a character s/he would like to be. This guaranteed that every child felt like a star. They were portraying exactly the character they wished to be and had to describe whether it was good or evil, what age s/he was to be, and any other characteristics desired. The class was divided into three groups, each afternoon meeting with me for a week for about a half-an-hour. We would brainstorm and listen to many suggestions about the plot and how to include each character. Making up details was quite easy but getting a complicated enough plot required more effort, and often some help to create a theme. Sometimes the plot would develop easily, and other times I would go home after school completely baffled. Then the next day, back with the group, I would offer my suggestions and some from my husband. Often they would reject them! But perhaps it gave them an idea of the complexity needed because they would finally decide upon a good plot. As they participated in dictating, I read what had been accomplished the day before. I also showed them my notes, indicating the drafts needed before the final play was typed. And as we progressed, my suggestions for the theme were offered, some to be rejected and one to be accepted. So becoming playwrights involved mostly the children’s ideas but also mine; however, they had ownership of their story so the only suggestions of mine that were included were those that they approved of. Making up the three plays would take three weeks. Following each week, I would take the story home and over the weekend rewrite it in a play form. The first time I did this with a class, as soon as the plays were passed out, some children began to count how many times they had speaking parts. So from then on, as I wrote the plays, I kept a tally so every child would have the same number of speaking parts, usually five. We always had a narrator who explained about the passage of time and any information that might have been an overload for the characters. Narrators had more to say than the actors and actresses, but it was accepted because instead of memorizing, they read their parts. The narrator was chosen from volunteers who wished to be one. The ones who didn’t get chosen still had the opportunity to choose a preferred character. After the plays were written, reproduced, and sent home, children had a week to memorize their lines at home while we made scenery and costumes in school. Then one week for rehearsals and finally, the production. Our study of Drama took three weeks. In my combined first and second grade, activities during Choice Time provided children with opportunities to make discoveries and achieve mathematical understanding through play. In the Math Center, while constructing, playing games, and pondering puzzles they were problem solving, using logic, and gaining various concepts of number. The Art Center also provided opportunities for expanding math concepts through creating constructions, collages which involve sorting and classifying, and carrying out ideas for patterning. And throughout the year, there were studies and emphases on symmetry and patterning. These concepts are assets for good achievement, enabling children to fully understand their math. Plus, new math concepts in the district-required math books always involved concrete experiences and manipulatives. Lots of them in various forms. Yes, it’s possible for children to manage correct answers in their books without understanding, but that guarantees from about third grade on – huge difficulties. I always hoped that they would know how and why they arrived at their answers and see the purpose of learning math in their daily lives. Then good abstract math would follow. The children also understood that there may not be only one right answer in all circumstances. They should think about it. You know, a three-year-old once taught me that 1 + 1 = 1. It was a beautiful day outside when he was concentrating upon pouring a heavy pail of water into his pail of sand. When he finished and looked down at his pail of sand he was shocked and asked, “Hey, what happened to my pail of water?” He found out that one pail of sand, plus one pail of water, equals one pail of wet sand. So, questioning results in class was encouraged, so that math could be fun and creative and encourage problem solving. Art for young children entails an exploration of materials, a way of learning further about their world. When children are engaged with paper-cutting, gluing, constructing, coloring, designing, collaging or whatever, they should be able to participate at their own maturity level. 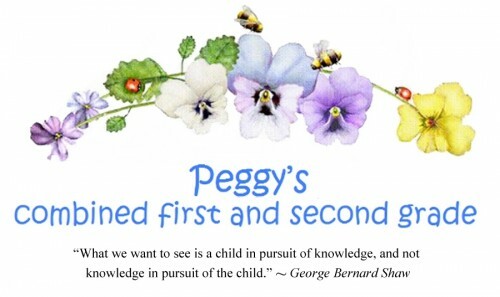 Piaget believed that children need activities that they can relate to in their own past experiences and from there, will seek novelty. It’s this novelty that fosters a child’s growing intellect. Therefore, it’s important to offer as many different materials as possible to stimulate interest and provide opportunities for new and interesting creations. As they interact with old and new materials, to paste or construct or paint, each child is able to thrive and grow. It is the process of art that should be emphasized. When participating in art using their own ideas, children are learning a tremendous amount. They have opportunities to develop the very same cognitive traits necessary to succeed in academic areas. In many art activities, there are possibilities for understanding transformations and reversibility. A child who doesn’t understand these characteristics while cleaning tables with sponges will squeeze the water out all over the table. Then he will saturate the sponge with that same water squeezing it out on the table and this is repeated over and over again – until finally realizing that the saturated sponge must be squeezed out in the sink. So, he has watched the water from a small sponge spread out over the table, a liquid being transformed, and then is able to soak up the same water into the sponge again, and see that same liquid reversed. Transformations are evident in all kinds of painting – brush painting, finger painting, ink blots, and string painting. Paper folding after cutting out designs for snowflakes shows transformations, and then reversibility is evident if after the paper is unfolded, it is re-folded to show the original state. There are opportunities to become aware of similarities and differences by discovering objects that will print and not print, can be pasted or not pasted, can be taped or not taped and the possibilities of recognizing things that are larger or smaller, smoother or rougher, darker or lighter. Similarities and differences plus transformations and reversibility are pre-requisites to understanding classification. This requires a recognition of the relationships between the parts to the whole – using separate paints to make one whole painting; the whole to the parts – a piece of paper cut into separate parts; and the parts to the parts – whenever engaged in making symmetrical designs. There are numerous opportunities to aid in understanding conservation – the ability to recognize that different substances are the same amount no matter what types of transformations take place. This occurs when realizing, with that sponge full of water when it spread all over the table, that the same amount of water can be contained within the sponge again, and understanding that one ball of clay or play dough made into many different shapes is the same amount when put back together again into one ball. Overcoming egocentrism, the ability to understand other viewpoints than what is first observed, occurs when constructing with paper or boxes, or working with clay, or making mobiles. A child is looking at all sides and angles – offering the ability to see all aspects. And through social interaction with others while listening to various viewpoints, there are chances for good logical thinking, and problem solving. So, art activities for young children keep their minds active in numerous ways and should always be an important part of the classroom. A visual experience during a study of symmetry broadens children’s awareness of their world. It helps in facilitating their understanding with the patterning of numbers. As children become more familiar with symmetry, they also become aware of transformations and spatial relationships, directly related to geometry and science. In my combined first and second grade classes, a study of symmetry lasted at least half a year and more often all year. Library books were used for referral. Children noticed or were exposed to symmetry in their own world, inside and outside the classroom. They found symmetry in letters, people, animals, and kites and in nature with plants, flowers, leaves, and snowflakes. Building in the math center produced many symmetrical designs using Cuisenaire Rods, 1” cubes, and many other manipulatives along with geoboards, pegboards, and pattern blocks. Palindromes were quite a challenge such as “madam” and “aha”. Some classes found many three letter words such as “pop” and “eye”. They were fascinated with some phrases I found such as “a man, a plan, a canal – Panama” and “never odd or even”, etc. There were many designs made using pieces of folded paper with paints and scissors. One, two, or three colors of paint were placed in a construction paper fold, then folded and pressed gently before opening and revealing the symmetry. A little more complicated was using thin paper folded once or multiple times before cutting a design, while retaining some folded parts so it stayed together after opening. Of course, making snowflakes was very popular.